There are five main elements in Feng Shui. 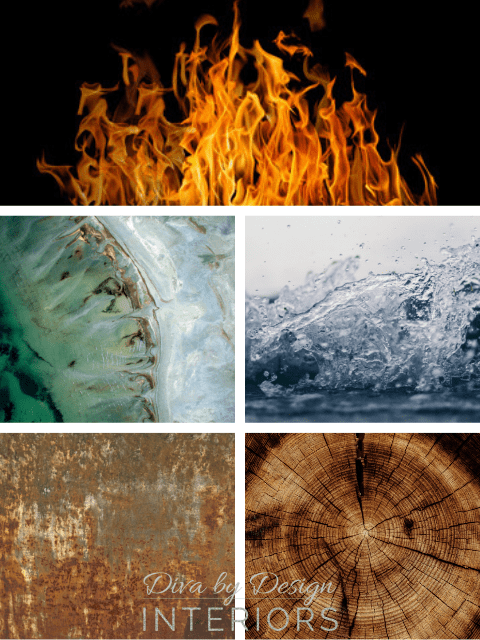 Fire, Water, Earth, Metal, and Wood. Each one has its own role to play in the spaces that you occupy and each element has a life area or aspiration that it influences. This element is high energy and symbolizes fame. Heat and passion are the words that describe this element. The colors associated with the Fire element are red, orange, bright yellow, bright pink, and purple. All of these colors will make you heart race and feed your energetic attitude. The shape of the Fire element is a triangle. The life aspiration that corresponds to Fire is called the Recognition and Fame area in the South. Fire is fed by the Wood element and calmed by the Earth element. Water is a refreshing element. It flows freely and brings an abundance of good fortune. The water element slows us down, soothes the mind, and relieves tension. Its colors are blue and black. The shape of the Water element is wavy, irregular, and curved. It corresponds to the Career Prospects life aspiration area in the North. The wealth Water energy is fed by Metal and calmed by Wood. The energy of this element brings a feeling of stability and security to your home. Its colors are pale yellow, tan, and beige. The Earth element is nurturing. The shape that symbolizes Earth energy is a square. It corresponds to the Marriage and Romantic Happiness life aspiration area in the Southwest as well as the Education and Knowledge area in the Northeast. Earth is fed by the Metal element and calmed by the Wood element. This element seems hard and impersonal, but it represents efficiency and clarity.of mind and purpose. Metal colors are white, gold, silver, and gray. These colors brings clarity and focus. Metal has definite lines and the shapes associated with it are domes and arches. There are two aspiration areas for Metal. These are the Mentors and Networking Area in the Northwest and the Children and Projects Area in the West. Metal energy is fed by the Earth element and calmed with the Water element. A symbol of growth and prosperity, Wood is health, healing, and balance. It soothes the heart and helps to lessen fears. The colors of the Wood element are green and brown just like a tree. The shape of Wood is a tall column. The corresponding life aspiration areas are Family and Health in the East and Wealth and Prosperity in the Southeast. The Wood element is compassionate and calm, and helps resolve or prevent conflicts. Each Feng Shui element serves a different purpose in the home or office. The associated colors and areas that work best with each element help you to build positive energy throughout your home. Each area will be strong in a particular element and give you a certain feeling when you enter the room. My new video workshop “Opening the Door to Success” delves even deeper into this subject and is available for purchase for $15 here. ©Diva by Design 2019. All rights reserved. Christina Rodriguez is an award-winning interior designer and decorator, feng shui enthusiast, & contributor to the Valley Women Inspire magazine from Harlingen, Texas. She is the leader of her local FemCity© Collective and a member of the Organization of Women Executives in Mcallen. When she’s not out and about in the community supporting her fellow women business owners, Christina is creating home and office designs that speak to the hearts of her clients and set them up for success. For more information on how she can help you create a space that echoes your heart, click here.